The former Illinois governor faces the prospect of 10 or more years behind bars on 18 corruption counts, including trying to auction off President Barack Obama's old Senate seat. CHICAGO — Rod Blagojevich was clearly the ringleader of the schemes for which he was convicted, a federal judge said today at the sentencing hearing for the ousted Illinois governor on corruption charges that include trying to sell an appointment to President Barack Obama’s former Senate seat. U.S. District Judge James Zagel also said he believed there was ample evidence Blagojevich wanted $1.5 million in campaign contributions for the seat — comments that could signal a harsher sentence. Calling “absurd” a defense suggestion that Blagojevich was being manipulated by staffers and advisers, Zagel said it was apparent from secretly made FBI recordings that Blagojevich relentlessly worked to use his authority to benefit himself. Blagojevich, who sat at a defense table in a dark pinstripe suit, was expected to address Zagel later in the day. Before proceedings began, he stood, rubbing his hands and occasionally biting his lip. His wife Patti sat behind him on a spectators’ bench, and her brother put his arm around her. Blagojevich’s two daughters were not present. The impeached state executive-turned-reality TV star has good reason to feel anxious at the two-day hearing. He faces the prospect of 10 or more years behind bars. If Zagel settles on a sentence of more than a decade, that would make it one of the stiffest penalties imposed for corruption in a state with a long history of crooked politics. Prosecutors want the twice-elected governor sentenced to 15 to 20 years, arguing that he has not only shirked all responsibility for his crimes but repeatedly thumbed his nose at the U.S. justice system. Blagojevich’s attorneys have said he has already paid a price in public ridicule and financial ruin, and propose a term of just a few years. They have also taken an approach judges often frown upon at the sentencing stage: Continuing to insist their client is innocent. 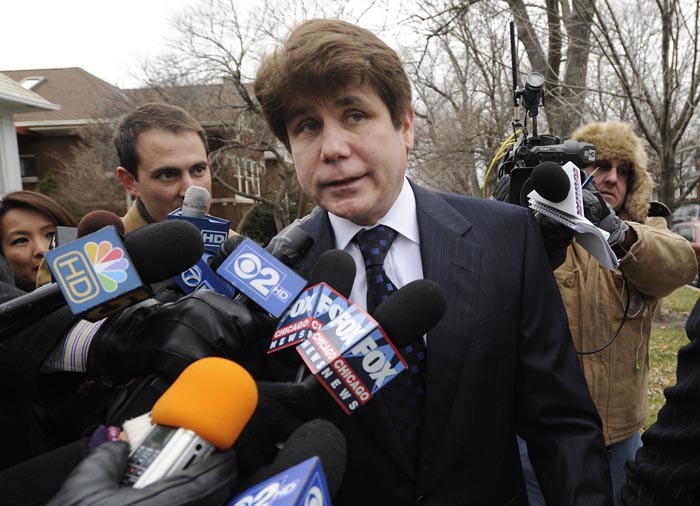 Legal experts have said Blagojevich needs to display some remorse when he addresses Zagel. But the big unknown is whether the often cocksure ex-governor will beg for mercy or yet again protest his innocence. A flat-out apology isn’t always considered a must. If it isn’t sincere, it could only anger a judge. But she also argued that the case was exceptional, saying the public wasn’t harmed. Gurland said Zagel should take into account the fact that Blagojevich did not “receive a single penny” in ill-gotten gains — unlike other cases in which politicians were convicted of public corruption. Both sides could finish their pitches to Zagel during today’s hearing, which was moved to a large ceremonial courtroom to accommodate expected crowds. Among the attendees were more than a dozen jurors from both trials, including both foremen. Zagel says he’ll wait until Wednesday to pronounce a sentence. The 70-year-old judge must answer nuanced questions according to complex sentencing considerations, including whether any good Blagojevich accomplished as governor counterbalances the bad. The first person to testify on Blagojevich’s behalf was Dr. Deanna Monroe. The Chicago pediatrician praised Blagojevich for creating the “All Kids” health insurance program, saying many children wouldn’t be treated without it. Also among those in attendance at court was Sister Susanne Kullowitch, 78, who said she believed Blagojevich deserved mercy, noting the good she said he had done as governor for the elderly. After sentencing, Zagel will likely give Blagojevich weeks before he must report to prison. Once there, the man heard scoffing on FBI wiretaps about earning a low six-figure salary would have to take a prison job — possibly scrubbing toilets — at just 12 cents an hour. Blagojevich’s sentencing comes just days before his 55th birthday and three years to the week of his Dec. 9, 2008, arrest. The jury deadlocked in his first trial, agreeing on just one of 24 counts — that Blagojevich lied to the FBI. Jurors at his recent retrial convicted him on 17 of 20 counts, including bribery.